Every year we see performances that make us say, ‘how did that happen?’ Whether it’s a later round draft pick establishing himself as an elite player, a backup thrust into a starting role who outplays the starter, or someone who came back sooner than expected from an injury. This article is for them, the most surprising performers from the 2018 season. When a quarterback doesn’t throw for a whole year, they’re not usually supposed to get better. That’s precisely what happened with Luck though. 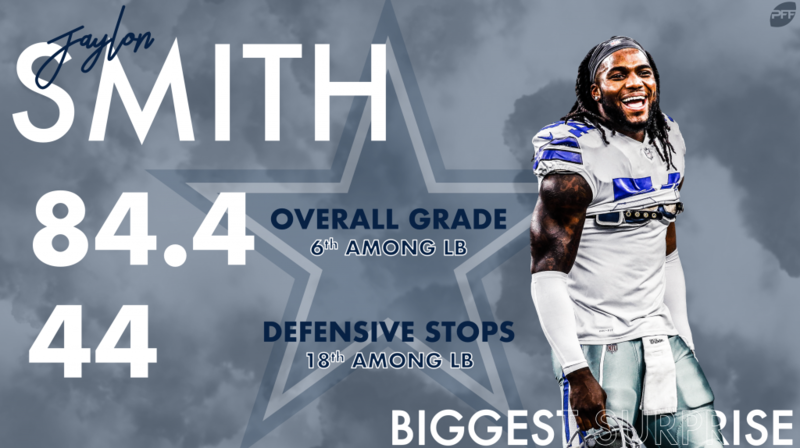 His 91.2 overall grade his past season was the highest of his entire career as he picked up right where he left off. Kittle was certainly a surprise in 2017, as he produced much better than you’d expect from a rookie fifth-rounder, racking up 515 yards on the season. Be that as it may, I don’t think anyone predicted he’d go from that to vaulting himself into the conversation for the best tight end in the NFL so quickly. He finished with 88 catches, 1,377 yards, and 873 yards after the catch – the latter being a PFF single-season record. Boyd had two very non-descript years with the Bengals after being taken in the second round of the 2016 draft. He was a nice third option but didn’t do much to warrant more consideration than that. When A.J. 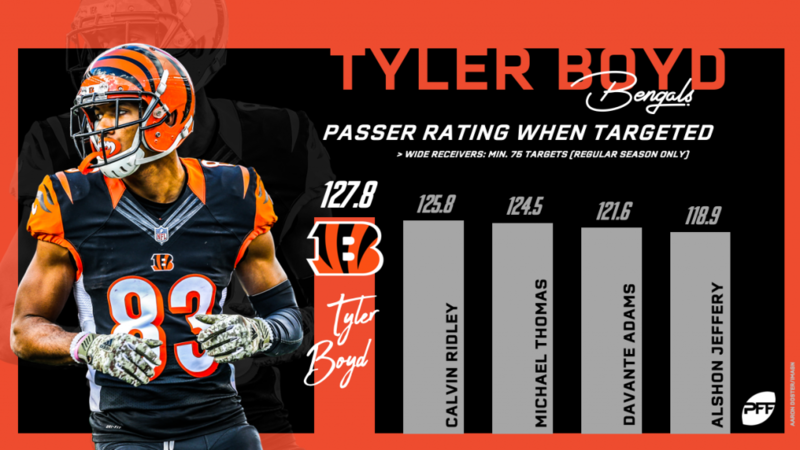 Green was hampered with injuries this past season, Boyd took the reins and looked like a number one receiver in his own right. He went over 1,000 yards and put up the highest passer rating when targeted of any wideout with 100 targets (127.8). Pretty much anyone could have had Blythe after he was waived by the Colts after the 2016 season. The former seventh-rounder in 2016 was picked up by the Rams and stumbled to a 51.8 overall grade on 196 snaps of backup duty that year. When starter Jamon Brown started the season with a two-game suspension, Blythe was thrust into a starting role he wouldn’t relinquish. He finished the season ranked 10th among all starting guards in the NFL. Everything said about Kittle above pretty much echoes for Jackson. He was nice for a fourth-round rookie in 2017, but nothing suggested he’d be the best safety in the NFL this past year. 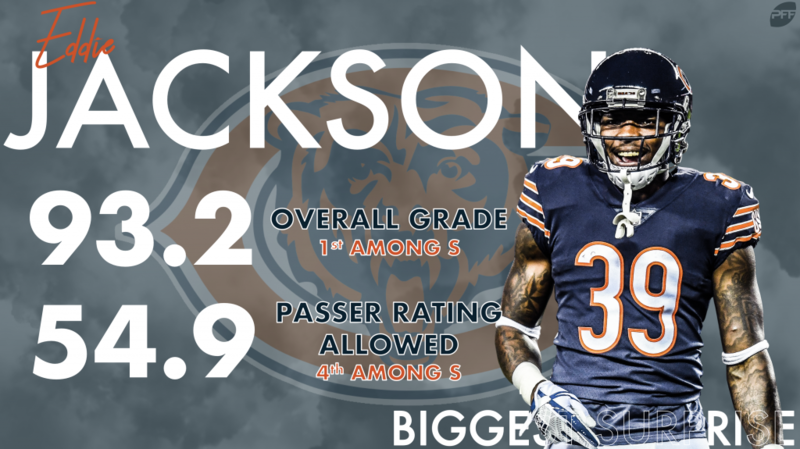 Jackson led all safeties in both picks (6) and pass breakups (8) in 2018. Ford went from uninvited to the combine to rock-solid nose tackle in the course of a year. The undrafted 5-11, 310 pounds nose tackle from Texas was an immovable rock in the middle of the Seahawks defense down the stretch. He earned a 90.0 run-defense grade on 265 snaps as a rookie. Harris came in for an injured Andrew Sendejo in Week 6 and never gave back the starting job. After never playing more than 254 snaps in a season since going undrafted in 2015, Harris earned an 89.0 overall grade on 624 snaps this year. Ford had one three-game stretch back in 2016 that hinted he was capable of elite play, but there was truly nothing else that could have prepared us for this. 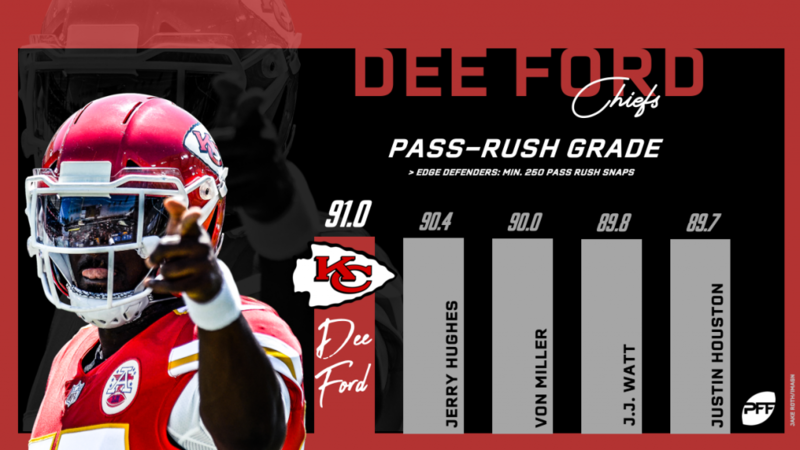 His previous career-high pass-rushing grade was 65.9 and finished 2018 with a 91.0. Ford’s 78 pressures led all edge defenders in the NFL. The former first-rounder in 2010 never quite lived up to the billing. He had only two seasons with 70.0-plus grades prior to 2018. With a bit of a role change to safety and slot corner at times this past year, Jackson turned into a swiss army knife for the Texans defense. He earned a 79.5 overall grade and a 90.4 grade in run defense. There were doctors that flat out stated he shouldn’t be on a football field after the nerve damage that he suffered in his knee. At times in 2017, that very much looked like the case. His injury almost completely robbed his ability to start and stop in the Fiesta Bowl before the draft. However, 2018 was a completely different story. Smith once again looked like the player he was at Notre Dame that received top-five hype before the injury. He finished as the fifth-highest graded off-ball linebacker in all of football, excelling in all three phases of the position.